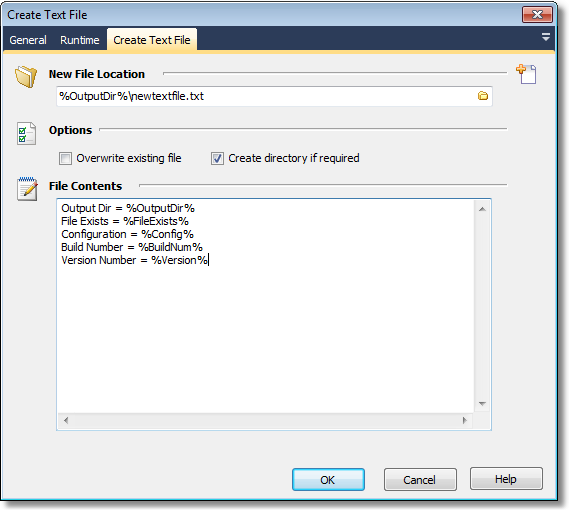 The Create Text File action enables you to create a new file containing text. To add text to an existing text file, use the Write Text File action. Path to new file to create. If this is not set, and the file already exists, the action will fail. If any directory doesn't exist in the new file location, then it will be automatically created. Specify the text to be written to the file. You can use FinalBuilder variables in the File Contents field to customise the file based on the build.